Rules for Nordic Championships as approved by the Nordic Sailing Federation 22.10.2010 will apply. When RRS 30.2 or 30.3 apply, the base of the triangle mentioned in these rules shall be the starting line and the extensions of the starting line to the starting vessel and the control vessel at the opposite end. The prescriptions of the National Authority will apply. Danish legislation requires every boat to be equipped with personal buoyance for the number persons on board at any time. International OK Dinghy class rules will apply. If there is a conflict between language versions, the English version will take precedence. Competitors will comply with ISAF Regulations, article 20 (Appendix 1) with regard to advertising. The regatta is open to all boats of the OK Dinghy class. All participants shall be members of their National OK Class Association. Entries shall be made by completing the online entry form on www.okjolle.dk/????? and the entry fee shall be received no later than Friday, July 29th 2016 to qualify for the early entry fee. For late entries, see 3.6 and 4.1. Late entries will be accepted with an additional fee (early entry fee plus DKK 200,). A boat is not registered until the regatta fee is paid. Early entry fee: DKK 900 until Friday, July 29th. 2016. Late entry fee: DKK 1.100 from Saturday, July 30th. 2016. - Dinner, Thursday, Friday and Saturday evening. Entry fees (see article 4.1 above) are paid electronically when registering on the entry web. Payment transactions shall be marked with name and sail number. Measurement and equipment checks can be made throughout the regatta at the discretion of the class representative, the race committee and the protest committee. Opening ceremony: Friday, August 12th, at 10:00 in Herslev Strand Sejlklub's club house. Rule 42 crash course: Friday, August 12th. At 10:30 in the surroundings of the club house. Instructor: ???. Friday, August 12th. 2-3 races scheduled. First warning signal 12:55. Saturday, August 13th. 3 races scheduled. First warning signal 10:55. Sunday, August 13th. 2 races scheduled. First warning signal 10:55. The warning signals for the following races of the day will be made as soon as practicable. On the last day of the regatta no warning signal will be given after 14:00. Proof of thirdparty liability insurance, see paragraph 17. Documentation for membership of a sailing club under an ISAFMNA. Loan declaration, if the owner is not onboard, when the boat is racing. Random measurement checks may be performed at any time during the regatta, at the discretion of the OK class organization representative. 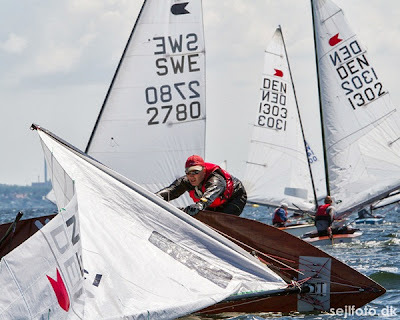 The Sailing Instructions will be published on www.herslevstrandsejlklub.dk website no later than: Saturday August 6th. 2016. Paper copies of the final sailing instructions will be available upon registration. The race area will be between ½ and 3 nautical miles from Herslev harbour. 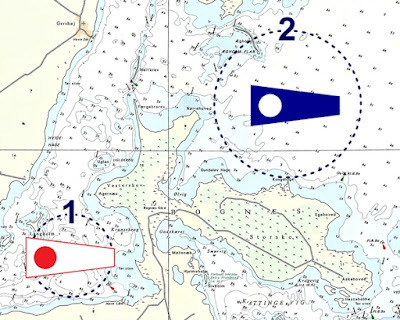 Which area will be signaled in the harbour with pennant one (1) or two (2). Warning signals will not be given earlier than one (1) hour in area 1, or two (2) hours in area 2 after signaling of the race area. The course to be sailed will be a triangular course. The course will be laid out with an objective of 60 minutes sailing time. A maximum time limit of 90 minutes will be applied for the first boat, and 20 minutes after the first boat for succeeding boats. Appendix P will apply with the following changes. Rule P2.2 and rule P2.3 are deleted. When a boat is penalized under rule P1 her penalty shall be a two-turns penalty under rule 44.2. If she fails to take it she shall be disqualified without a hearing. or deliberately to get an advantage even after taking the penalty, it shall consider protesting the boat for breaking rule 2, or calling a hearing under rule 69.2(a). A minimum of four (4) races have to be completed to constitute a Danish Championship. When five (5) races have been completed, a boats score will be the total of her race scores excluding her worst score. 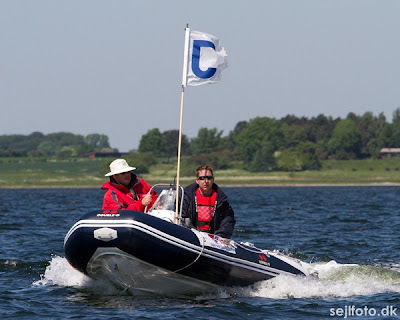 Support boats shall display their national flag or a white flag with their national letters as described in RSS appendix G.
Except in an emergency, a boat shall neither make radio transmissions while racing, nor receive radio communications that are not available to all boats. This restriction also applies to mobile cellphones. 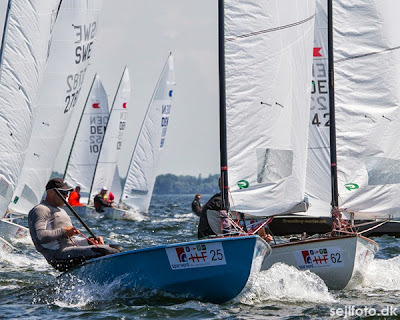 Gold, Silver and Bronze medals will be given to the first three (3) Danish boats. Additional prizes will be given. Prize giving will take place, as soon as possible, after racing on the Sunday. Each participating boat shall be covered by a valid thirdparty liability insurance. Accommodation: There is a camping area very close to the sailing club. When on the habour area, follow instructions given by the assigned volunteer at any time. 3.4 Afventer link (eventuelt til tom "dummy-side") på okjolle.dk - når vi går "i luften" vil dette også gælde side med tilmeldte. 5.4 jeg mangler navn på instruktør.